Funeral services for Stella Hill, of Morris, will be held on Tuesday, March 26, 2019 at 10:30 a.m. at Faith Lutheran Church in Morris with Reverend Dell Sanderson officiating. Visitation will begin at 9:30 a.m. at the church on Tuesday. Burial will be at Summit Cemetery in Morris. 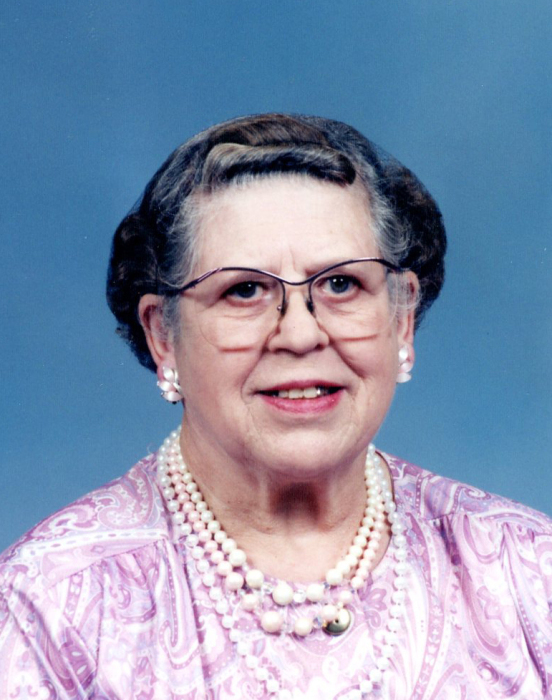 Estella Eunice (Reynolds) Hill, daughter of Charles Henry and Bessie Myrtle (Hollister) Reynolds, was born on June 6, 1922 in Boy River, Minnesota. She attended a one room school house with her siblings that went from K-8th grade. She left school after the 7th grade to take a job for a family who lived just outside of Chokio, where she looked after their 12 children and did various household chores. She also did housework for others in Morris, Chokio, and Donnelly. While in her 20’s, Stella lived in Fargo, North Dakota, and worked at the Tweeden Hotel as a housekeeper. It was while she lived in Fargo that she met Burtis “Bert” William Hill, who was her first and only love, the man that was her lifelong partner until his death in 1977. In 1950, Bert and Stella moved to Detroit Lakes, Minnesota and bought G.A.R. Corners of Highway 10 that they later renamed Hill’s Corner. Here they ran a gas station, café, and hotel until 1989 when it was sold. In 1992 Stella moved to Morris, Minnesota. Stella was an amazing, generous, selfless and loving woman who loved to keep busy by gardening, crocheting or quilting – just to name a few of her hobbies. She was the official keeper of the family history and has amassed a huge amount of information about all of us and our ancestors that she would share with anyone who was willing to listen. Lavender was her favorite color, she preferred old style country music back from the days when it was still called country western, yellow and red roses were her favorite flowers. She loved going to church. Every year, for her birthday, she would bake an angel food cake with strawberry frosting to share with her guests. Stella survived several surgeries to remove cancerous cells on her face, but it was a much more devastating cancer that eventually claimed her life. On September 12, 2018, she moved into hospice care at West Wind Village in Morris where she lived until her death on Saturday, March 16, 2019. She was 96 years old. Stella is survived by her sisters-in-law: Shirley (Richards) Reynolds of Morris and Roberta (Melvin) Reynolds of Cyrus; several nieces and nephews; as well as many other relatives and friends, that while too numerous to mention, were always dear to her heart. She is preceded in death by her husband, Bert; parents, Charles and Bessie; stepmother, Eliza; and her siblings: Loretta, LeRoy, Clara, Melvin, Richard, Opal, Harvey and Arthur. Pedersen Funeral Home in Morris is in charge of arrangements for Stella.